Eleazar Camez, Nicholas Isakson, Grace Isakson, Daniel Jilek and Patrick Lahey competed in the San Antonio Fiesta Quiz Bowl tournament at John Jay High School on Saturday March 29th. This tournament served as the Eagle's final tune up heading into the state championship tournament next weekend. Savio got off to a quick start, defeating the "A" and "B" teams from Harlandale High School by the scores of 265-110 and 270-25. San Antonio's MacArthur High School proved to be a tougher test, but the Eagles' tournament experience showed as they fended off a late rally attempt and pulled away with a 240-120 victory. The Eagles were feeling good with their 3-0 start, but they hit a bump in the road against Keystone High School. It was a tight match with high drama. One officiating blunder was resolved in a manner unfavorable to the Eagles, and a series of late NEG5's by Savio left the door open for Keystone. On the final toss-up Keystone was able to seize the victory by a score of 185-180. Keystone ended the prelims with a 6-0 record and the #2 seed for the playoffs. Savio got the bad taste from the Keystone loss out of their mouths with a convincing 240-110 victory over Warren High School. 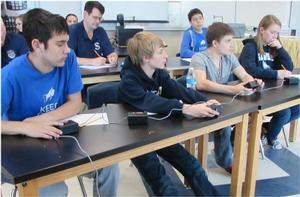 The final preliminary round match pitted Savio against San Antonio Reagan. It was a back and forth battle early, but at the end of round #13 the Eagles had built a big lead. Then something magical happened. The Reagan team caught fire, nearly shutting out the Eagles on the final 7 rounds of the match, taking the game 320-190. Reagan finished the prelims as the #3 seed, with their only loss coming against Keystone. With a 4-2 record the Eagles managed just the #6 seed. Convinced they had shaken out all their bad luck, they looked forward to a chance at redemption in the playoff round. After easily eliminating the Flour Bluff "A" team 295-70 in the first round, the Eagles got their chance at revenge against Reagan in the 2nd round. Again the first half was a back and forth battle, and again the Eagles built a commanding lead after round #13, 165-55. But 14, 15, and 16 proved to be unlucky once again for the Savio team. The same fire that touched off the Reagan rally in the prelims caught them again, and they shut out the Eagles in the final 7 rounds. Final score Reagan 270, Savio 160. Reagan's hot streak continued as they defeated Keystone in the semi-finals 275-165, and destroyed Clark High School in the finals to claim the tournament championship, 470-55. In the final results Savio ended in a tie for 5th place. The Eagles' top scorer was Daniel Jilek with 37.14 points per game (7 powers and 5 NEG's). The stage is now set for the Eagles in the state tournament next weekend. They will compete against 13 other teams, including San Antonio Reagan, at Trinity University in San Antonio on Saturday April 5th. This will be the team's final event in Texas for 2013-2014. But in June seven members of the team will travel to Chicago for the National Academic Championship tournament. "Savio baseball improved to 3-0 in district play and a 19-3 overall record with a 3-1 victory over Corpus Christi Incarnate Word. Dominic Kress recorded his 3rd win on the mound and Nick Zamora came in for the save." "Savio scored early on a single to right by Tanner Martinez bringing in Nick Zamora. Tanner would later bring in a run on a suicide squeeze to give Savio a 2-0 lead. Nick Zamora would add the 3rd run by stealing home after stealing second and third. 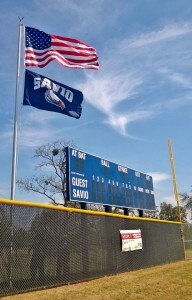 Savio held on with great defense behind their pitching." "After the game Savio baseball attended mass at St. Williams Catholic Church in Round Rock as a team with the entire coaching staff. What an amazing experience and getting a standing ovation was pretty inspiring as all the boys were in their Savio mass uniform." The Savio Boys and Girls Golf teams competed in the Regents Invitational on Tuesday, March 25 at the Grey Rock Golf Course. The challenging course, with some of the longest greens played this year along with many sand traps, was further complicated by the cold and windy weather. Both teams rose to the challenge and played some great golf. The Boys team was led by the team and schools first individual boy medalist, Sophomore Clayton Navel, along with Junior Bradley Musabika, Sophomores Shane Hoelting and Jacob Hoelting. The Girls team brought home a 3rd place finish and were lead by individual medalist Junior Brooke Ellis along with Sophomores Savanah Acosta, Shelbie Sagnes, Layne Smith & Freshman Connor Neill. Congratulations to both teams and individual medalist Brooke Ellis and Clayton Navel. The next tournament for both teams will be the district tournament on April 8. 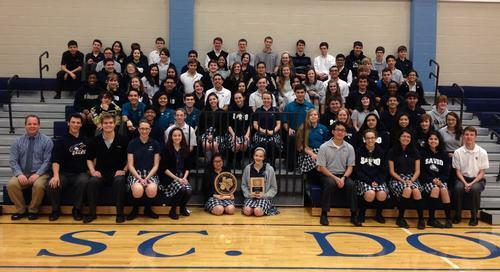 Congratulations, the final results are in and the Savio instrumental program is the 2014 Class 4A TAPPS State Instrumental Music Champion. This now continues a four year legacy of state championship for our Savio music program. Savio Lady Eagles 4x400m Relay Team Qualifies for the TEXAS RELAYS!!! The Savio Lady Eagles 4x400m Relay Team has qualified into the 87th running of the very prestigious TEXAS RELAYS!! The team, comprised of Angele Kelly, Alexis Phillips, Jennifer Ezuruike, Ana Richie and Stephanie Moses, will compete at 4:30 pm this Friday, March 28 at Mike A Meyers Stadium in Austin. 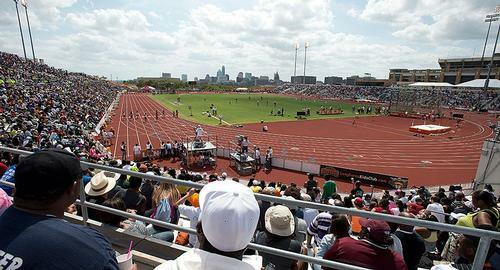 The "Clyde Littlefield Texas Relays" is one of the most exciting Track & Field events in the world. Each year, around 50,000 avid Track fans converge on downtown Austin to cheer the world's elite high school, collegiate, and professional athletes as they compete on the 3rd fastest track in the world. Over the course of the five-day event, a total of 6,552 athletes from 32 states and nine countries are expected to compete, including athletes from as far as Brazil and Japan. Seventeen hours of action will be broadcast on the Longhorn Network over the first four days of the event. ESPN's Dave LaMont will provide play-by-play throughout the meet, with Larry Rawson, an Emmy Award-winning track and field sportscaster, and Dwight Stones, track and field Olympian, serving as analysts. The 4x400m Relay is listed as a premier high school level event, so expect a large crowd if you are planning to attend. Texas Relays tickets may be purchased in advance online at www.texassports.com or by calling the UT Athletics Ticket Office at (800) 982-2386 or (512) 471-3333. They can also be obtained at the Mike A. Myers Stadium Box office during the event. Entrance to the Texas Relays is free on Wednesday, March 26 and Thursday, March 27 with $20 reserved seating and $10 general admission tickets available for Friday and Saturday. All-session passes can also be purchased for $40 (reserved seats) and $20 (general admission). Single-day tickets go on sale Monday, March 24. Please congratulate these hard working and talented ladies on this proud accomplishment! We are honored to have them represent St. Dominic Savio Track & Field at a world class event. Fan support in the form of attendance on Friday, verbal praise and well wishes, and prayer for our athletes is needed and greatly appreciated!! Let's cheer our "world class" ladies!! !